Don't be fooled by the Huawei GT's beautiful, slim design - it's a tough piece of kit, and even has a diamond-like carbon (DLC) coating. Depending how you use it, you can get up to two weeks' battery life in between charges. And if you're into your fitness, you can track your activity, monitor your heart rate and even wear it in the pool. The Huawei Watch GT is made of tough stuff. Whether you’re out trail running or doing some home improvements, your watch should survive any bumps and knocks, thanks to its ceramic bezel, stainless steel shell and diamond-like carbon coating. And it’s not only beautiful and strong, but slim too. At only 10.6 mm deep, and with a double crown 1.39” 454 x 454 AMOLED colour screen, you'll find it comfy to wear and easy to use. 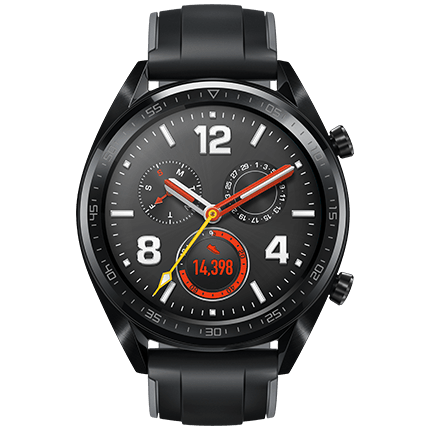 The Huawei Watch GT has the first double chipset architecture in the industry and, depending on what you use it for, you could get up to two weeks of battery life between charges. If you have the heart rate monitoring on and you exercise for 90 minutes per week, two weeks' battery life is realistic. And even if you use continuous exercise tracking, heart rate monitoring, GPS and real-time heart rate reporting, you can still expect up to 22 hours' battery life. Then just charge your watch up and get tracking again. Keep an eye on your resting and active heart rate, with Huawei’s TruSeen™ 3.0 heart rate monitoring technology. Whether you’re working up a sweat at the gym, hiking in the countryside or doing a yoga practice, you’ll get a more efficient and accurate heart rate measurement, thanks to the self-learning algorithm and innovative sensors. Competitive swimmer? Triathlete? Or just like the odd dip in the pool? Whatever your story, the Huawei Watch GT can help you up your swimming game. Water resistant up to 50 metres, it can recognise and improve your stroke. And it'll automatically provide a SWOLF (Swim Golf) score at the end of your swim, to measure your efficiency in the pool. Get £50 off the Huawei Watch GT between 4 Apr 2019 and 8 May 2019 when bought directly from O2 via Priority. Subject to availability, while stocks last. Terms apply, see o2.co.uk/terms. Get your device in minutes. Buy the device you want online, and pick it up from your local store. If it's in stock you can collect it the same day, and could even get it in minutes. Collection times could vary depending on stock and staff availability in your chosen store. Check opening times for Christmas collection.